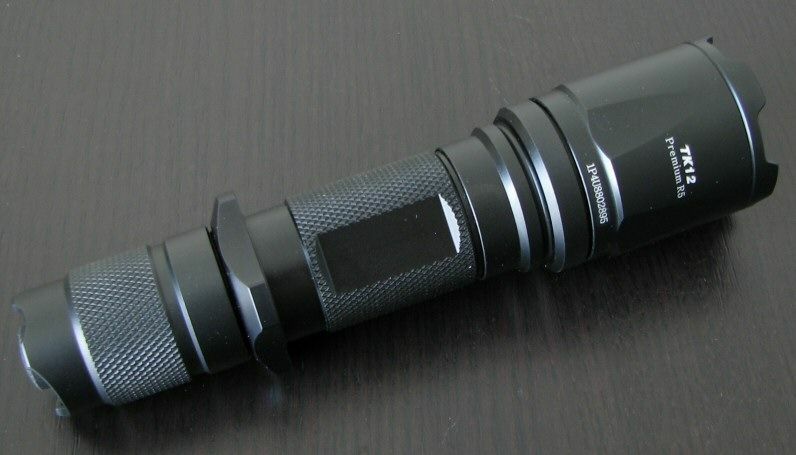 Fenix TK12 (XP-G R5) Review: RUNTIMES, BEAMSHOTS, PICS and more! 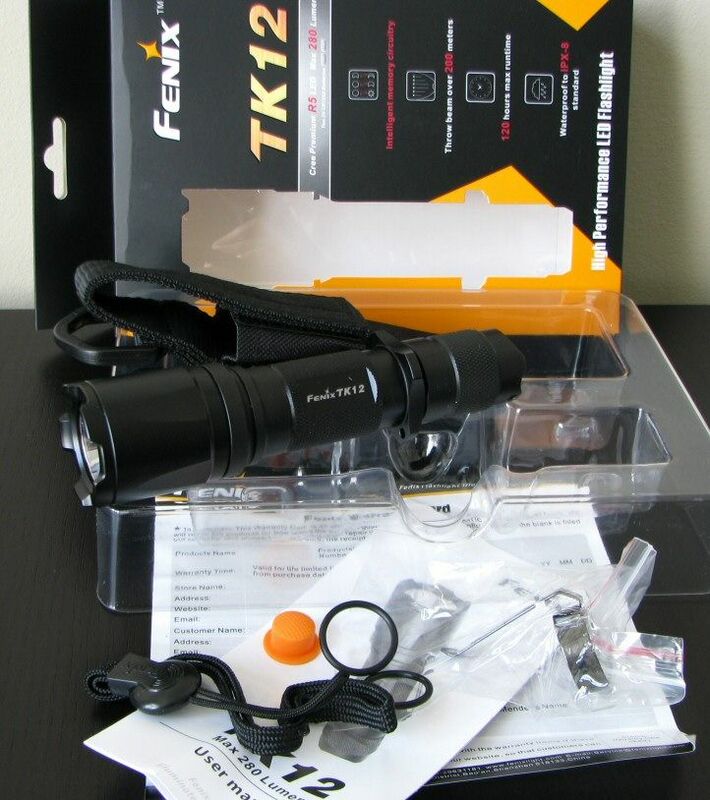 Thread: Fenix TK12 (XP-G R5) Review: RUNTIMES, BEAMSHOTS, PICS and more! Reviewer's Note: The Fenix TK12 (R5) was provided for review by the Canadian Fenix distributor Notosora International Imports Ltd. Please see their website for more info. Warning: pic heavy as usual! 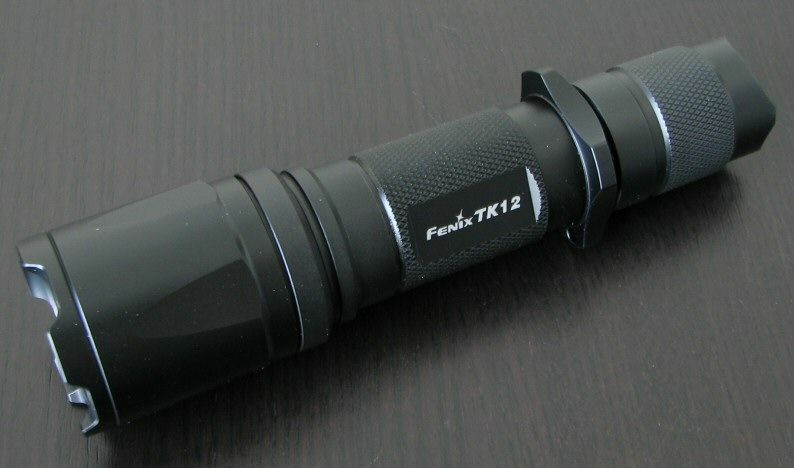 The TK12 is part of Fenix’s tactical TK series of lights (also known as “Tank” lights). Along with the TK11, the TK12 has recently been outfitted with the latest Cree emitter - the XP-G - with a R5 output bin. The TK12 comes with a black aluminum bezel, removable black aluminum cigar grip ring and removable black body clip (with titanium exterior coating). Included in the package is the manual, warranty card, spare o-rings, extra orange tailcap boot cover, wrist lanyard, and belt pouch with closing flap. 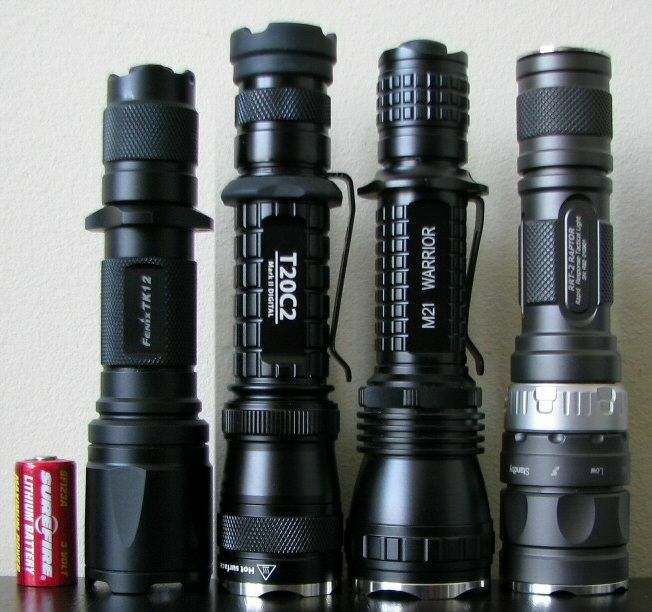 From left to right: Surefire CR123A, Fenix TK12, EagleTac T20C2 MarkII, Olight M21, JetBeam Raptor. 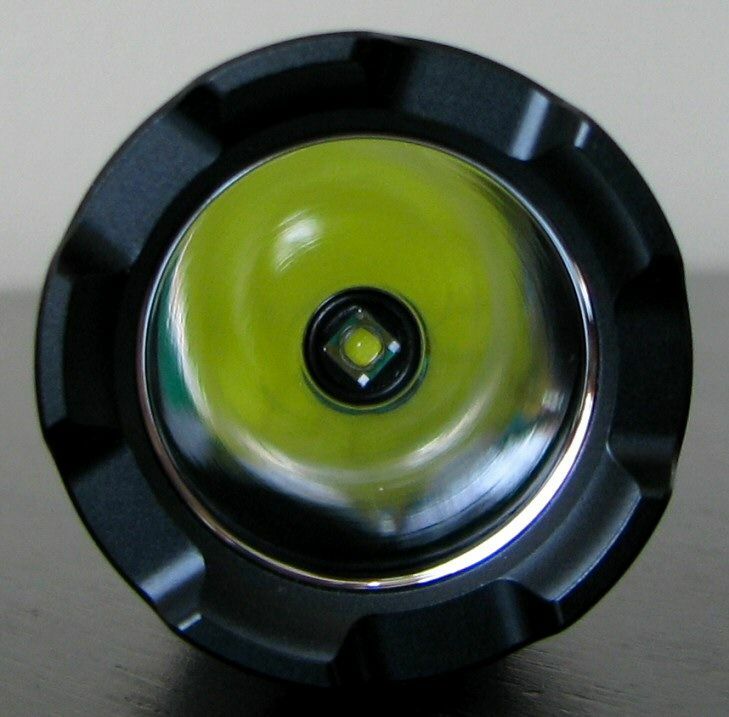 A little shorter than most of the competition, overall weight and diameter is consistent with other Cree-based lights. On the surface, fit and finish are very good on my sample. No flaws in the matte black type-III hard anodizing. Knurling on the body and tailcap is about average in aggressiveness. Identification labels are clear, although not as bright as some of the competition (that may not be a bad thing ). The grip ring is removable, but you have to take off the tail o-ring first. 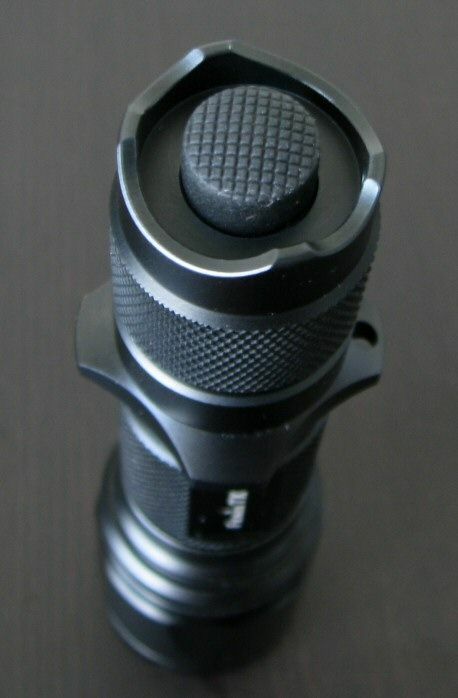 The black clip (with titanium coating) is similar to the Fenix LDx0/PDx0 series. Screw threads are anodized for tailcap lock-out. Screw threads seem to be high quality, with a square-cut at both the head and tail regions. Due to the protruding forward clicky, the light cannot tailstand in stock form. But given that the tailcap sides are built-up slightly, you should be able adjust to the switch to potentially allow tailstanding. (e.g. add a washer underneath). Note the body walls are fairly thick on the TK12, in keeping with its “Tank” family status. I imagine you could probably drive over this light with your car without much damage to the body. Unlike a number of recent 18650-lights, my TK12 sample can take the newer flat-top high capacity (2600 mAh) AW 18650 protected cells. 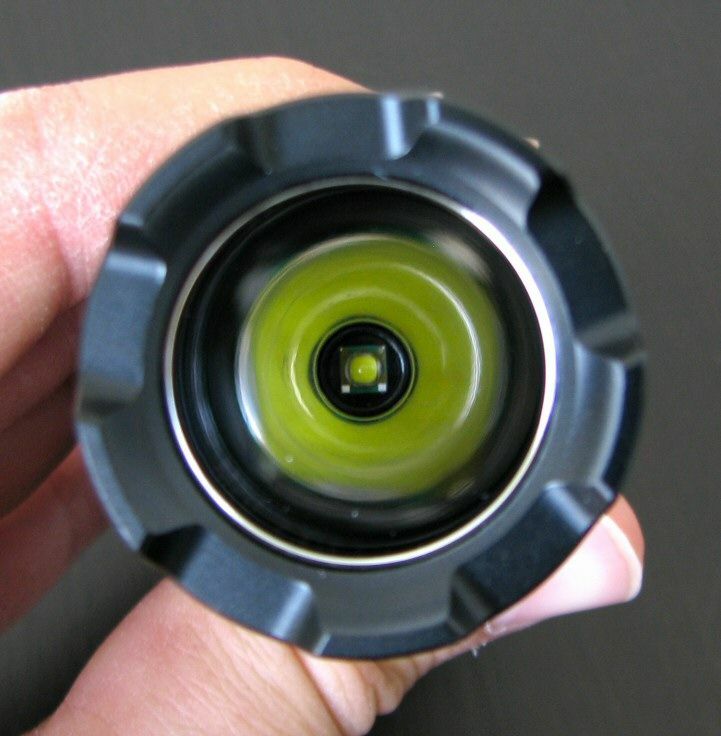 The TK12 uses the new Cree XP-G emitter, with a cool-white R5 output bin (no tint bin reported). As you can see above, my sample came with a smooth reflector. Unlike some of the competition, the head of the TK12 appears to be sealed. This means that reflector, bezel, etc is not user swappable. And now for the white wall hunting … both lights are on Max on an AW protected 18650, about 0.5 meters from a white wall. Even with the Smooth reflector, the TK12 has a very even beam with no obvious rings (presumably thanks to the XP-G emitter). Like with many XP-G-based lights with deep reflectors, there is some evidence of a slightly dark centre to the hotspot (i.e. a faint donut pattern). This is only noticeable at a distance – and only if you are looking for it. It is not at all distracting in this case. The TK12 has an updated interface from the classic Fenix dual-stage head twist. 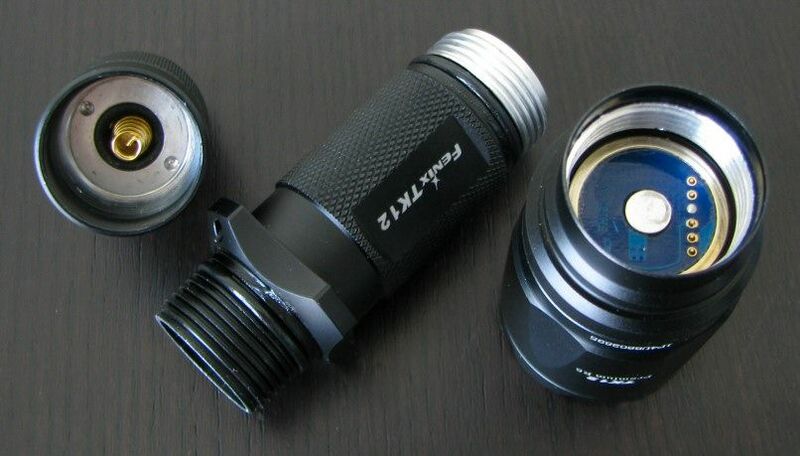 In basic terms, you can access two modes at a time as you would expect for a Fenix light. For example, in the light’s “Default Mode”, tighten the bezel for Turbo mode (280 lumens), loosen for Lo mode (65 lumens). But you also have two other possible pairs of modes – “Camping Mode” (120 lumens/11 lumens) and “Hunting Mode” (280 lumens/Strobe). To switch between the three possible mode pairs, do two loosen-tighten switches from tight within 0.5 secs (i.e. loosen – tighten –loosen –tighten). The light will advance to the next mode pair in sequence, with a flash to notify you. Do another double twist cycle to advance to the next mode pair. The light has a memory feature, and remembers what mode pair you are in when you turn it back on. And of course, you can always tell if you are in the tightened or loosened state for that mode pair before turning on. In practice, this works well. Most of the time, you will are likely to leave it your preferred mode pair. One thing to note – the sequence of mode pairs is actually Default – Hunting – Camping, not Default – Camping – Hunting as reported in the manual. Strobe frequency was measured at a “tactical” 16.5Hz. Consistent with other Fenix lights, I was unable to detect any signs of PWM. As the runtimes clearly indicate, lower output levels appear to be current-controlled. Throw is pretty good for a XP-G equipped light. Clearly, the smooth reflector is helping here. Overall output on Turbo is right where I would expect for a “tactical” heavily-driven R5-equipped light. Note: Effective January 2010, all CR123A runtimes are now performed solely on Titanium Innovations batteries sponsored by BatteryJunction.com. You can compare the generally excellent performance of these CR123A cells relative to the Duracell/Surefire cells used in all my earlier reviews here. I have marked all the new runtimes of lights with Titanium Innovations CR123As on the graphs with an "*". For all runtimes below, “Max” refers to Default/Hunting max output mode (i.e. 280 lumens), “Hi” refers to the Camping max output mode (i.e. 120 lumens), and “Med” refers to the Default output mode lo mode (i.e. 65 lumens). The Camping lo output mode (i.e. 11 lumens) was not tested. As we have come to expect from Fenix, overall output/runtime efficiency is top notch! I am particularly impressed by excellent output, efficiency and regulation on 18650 on Max - that is quite rare in a multi-power light. Interesting, while output levels are very well matched to my EagleTac R5-equipped lights, the TK12 seems to consistently exceed my P20C2-II and T20C2-II in runtime on all batteries. Of course, the difference isn’t that great – and I may just have a particularly efficient TK12 sample. On my sample, there is a slight indication of the well-known XP-G dark-centre effect in the hotspot (i.e. a faint donut pattern to the hotspot). It is mild in this case – remarkably so given the smooth reflector (OP generally helps even it out). Not a major issue, but still something to keep in mind when looking at all XP-G lights. The head of my unit seems to be sealed. While this should insure solid reliability and performance, it also means that the components are not user-swappable (i.e. no changing of the reflector, bezel, etc.). The light can’t tailstand in its default form. But given the slightly built-up external ridges, you should be able to jury-rig a tailstanding solution by adding an appropriately-size washer around the boot cap cover before installation. The TK12 is an example of the mature evolution of the Fenix “Tank” series of lights - it is a physically robust build, with a straightforward design and feature set. The R5 output bin insures a good amount light on the Max setting, and the TK12 seems to be driven as hard as competing lights in this class (e.g. EagleTac). Although I cannot verify exact lumen counts with my setup, I can tell that the relative output levels are consistent with Fenix’s specs (i.e. proportional with 280/120/65/11 lumens). In fact, I suspect Fenix’s specs are fairly accurate as OTF (out-the-front) lumens. The beam is pattern is quite good for a XP-G-based light (i.e. throw is reasonable, and the dark-centre void of the hotspot is fairly minimal on my sample). That being said, I know most users prefer a little more throw on their 2xCR123A lights – you may want to look at the earlier XR-E R2 lights if that’s an issue for you (but be prepared to accept ringier beams if you do). Output/runtime efficiency is certainly top-of-its-class - as we have come to expect from Fenix. Good to see such reliably strong performance at all output levels and on all battery configurations. Rest assured that however you choose to run the light, you will get the best possible performance. I also don’t quite get why the tailcap ridges are built-up to seemingly allow tailstanding, but Fenix doesn’t supply a low-rise boot cover or suitable washer adapter with the light? And at a minimum, Fenix really should invest in better belt pouches – I doubt the bundled one would hold up to much regular usage (it really doesn’t match the overall quality of the light). But these are minor quibbles. It is certainly hard to argue with what you get here for the price – excellent performance, good selection of output levels, and a very solid build. 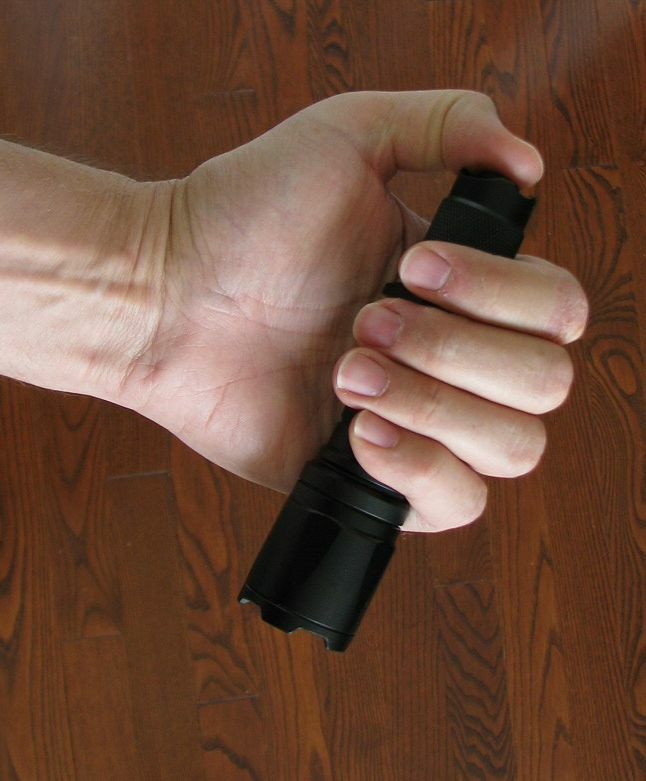 While not as flashy as some of the competition, the TK12’s sturdy design suggests it would be a reliable and serviceable companion as an every-day duty light. Last edited by selfbuilt; 09-19-2010 at 02:34 PM. Re: Fenix TK12 (XP-G R5) Review: RUNTIMES, BEAMSHOTS, PICS and more! Keep it up, my friend, we all appreciate your tremendous efforts ! P:S: After one more such review, lets say for the new Fenix TK21, and I will be outside 'cause I'll go , and pro-obably will get and then by my better half ! Based on your reviews, which light do you find has better throw? The TK12 or the Jet RRT-2 Raptor? No immediate plans to test the TK21, but I do have the LD10-R4/LD20-R4 on hand for testing, and a few other newer models en route. FYI, for those curious, there's no mysterious reason why I haven't been reviewing Fenix in awhile - it's just that neither they nor any of their dealers had asked me to! I don't usually go looking for lights to review - I tend to leave it up to dealers/manufacturers to suggest lights (and I turn down ones I'm not interested in). Don't really have time to review anything else. No contest here - the throw numbers in the tables in the review sum it up pretty well: the RRT-2 wins hands down. Ni-i-i-c-ce, more reviews from Selfbuilt, that can only put a 'UGE smile on my face ! Greatly appreciated! I just hope that you can still get enough sleep despite quenching our bottomless desire for new flshlight reviews ! Thanks for the lux numbers also. It's a bit disappointing that the TK12 doesn't throw better (at least to me). If I remember right, even the Q5 version of the TK11 would still produce about 11,000 lux. Sure hope someone will eventually have a reflector that can produce good throw with the XP-G. I'm guessing the TK11 R5 would also have similar lux numbers as the TK12? Think I'll stick with my TK11 R2 edition for now. I like being able to throw light waaay down the dark street at night! Thanks for another great review. This is the exact information I was looking for. 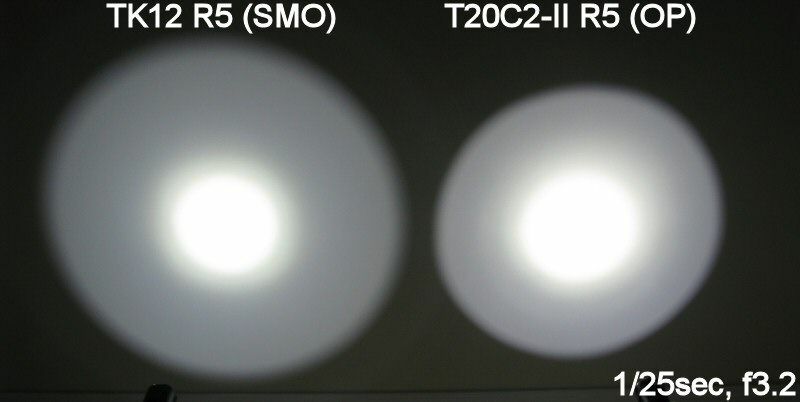 I am amazed in some of the differences in runtime between the T20C2 MKII and the TK12 R5. I would expect them to be a little different but this is a huge difference. Can't say for certain, but I suspect the TK11 would be comparable given the specs. Frankly, these results are as I would expect for a XP-G with this size reflector. If throw matters to you, you may want to stick with the XR-E R2s. But not to worry - I know of at least one light in development that will have much better throw from a XP-G. Can't say more right now, since it's still under wraps And I'm sure others will follow - but it will likely mean larger heads with larger and deeper reflectors. Keep in mind we are only talking n=1 sample here. Also, although my lightbox reports the TC20C2-II and TK12 have equivalent output, my ceiling bounce measure gives a marginally higher score to the TC20C2-II. It's hard to know for sure without more samples and a calibrated integrating sphere. No worries - it will be coming (likely sometime next week, since I'm a little swamped right now at work). Thanks as always for a great review Selfbuilt! Sitting next to me is a failrly new tk12 r2 which has a great beam, good tint, and is decently bright. It was hard for me to justify the R5 purchase when my R2 version is so good. You have made it possible for me to spend the money. Thanks as always for the runtime graphs. Fenix is really impressing me in this area lately. Again, great review! An outstanding review with profound stats shown and worthy for any one to make a justified choice prior to a hesitant purchase. Thank you and I certainly appreciate perusing the accounted details as facts from your workshop research. I can only suggest that you compare the new lights with their previous versions - Fenix with XR-E Q5, XR-E R2 and whatever you can get your hands on, of course! I'm curious woodrow ... what exactly made you feel the XP-G R5 version was worth the upgrade? Unfortunately, I don't have an XR-E R2 version to compare. Personally, I'm quite impressed by the 18650 runtime performance (regulation and efficiency), but I don't know what the earlier versions were like. On the flip side, fans of throw in this class of light may prefer to stick with the XR-E R2 (again, no sample to compare, but I'm sure it throws further than the new XP-G R5). No worries there - the LD20-R4 will be compared to the LD20-Q5, L2D-Q5, L2D-Q2, and L2D-P4 (plus the short-lived L2Tv2.0 Rebel 080 and 100 versions). I just picked up an Olight M20 XP-G R5 with OP reflector. I'd love to see Selfbuilt review this light for comparison with the Fenix TK12 XP-G R5. Do CR123a cells rattle at all in the Fenix TK12 since it can also accept 18650? 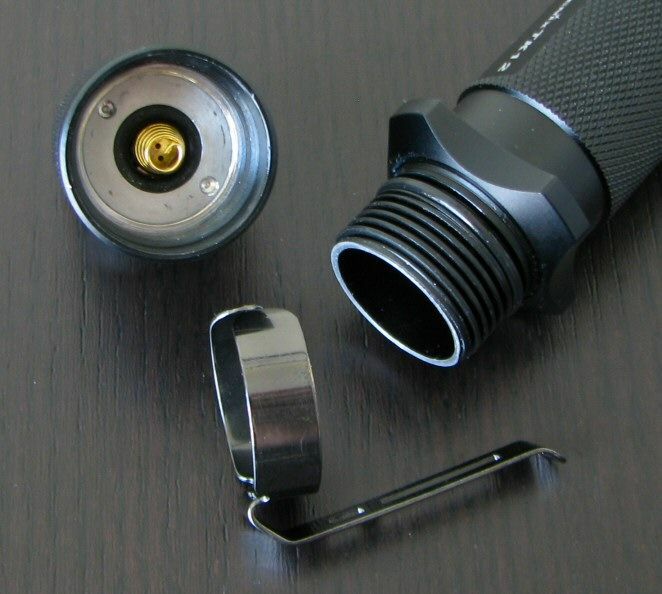 The Olight M20 comes with a battery magazine to eliminate the rattle. But I must ask the obvious question - WHY DON'T YOU HAVE THE DEVICE TO MEASURE LUMENS???? Goodness, you are like Einstein with this stuff. You truly seem to know what you're doing! So please get the equipment to measure lumens. I am surprised one of these manufacturers has not already supplied you with it. Do we need to start a donation page to buy this for you? Give me a PayPal address and I will send $20 right now to get the ball rolling. These outstanding reviews really should include accurate lumens measurements. Then they would be purrrrrrfect! PS - I'm totally serious about the donation pool. If that is what's needed, then let's make it happen. EDIT - Actually, I would be willing to pledge $100 towards the equipment. In exchange, maybe you could help me with some questions as I try to mod a few lights. Last edited by Chevy-SS; 05-11-2010 at 04:40 PM. Thanx a bunch for that review, I put in my order for one from one of the dealers on this site, great info! Thanks for the suppot everyone. This review has certainly garnered some attention ... looks like there is still a lot of interest in Fenix models! Actually, I found the rattle to be fairly minimal. It is there on all protected 18650-compatible lights (unless you use a carrier), but it seems less noticeable to me than typical on my TK12 sample. Because a true calibrated one costs well over $1000 (some significantly more). There's also the issue of maintaining calibration, adjusting for different size bezels (and bezel materials), etc. Frankly, that would be best suited for someone in a photonics lab where they had service contracts with the supplier and a regular working relationship. It also takes some time to become familiar with the ins and outs of any particular model, to understand its limitations. I certainly know the limitations of my milk carton ... which is why I don't report estimated lumens from it. But I do keep my little setup reasonably consistent over time by re-comparing older lights on a regular basis, so the relative comparisons hold. I just wish they had not stopped providing the "gold ring" to put on over the threads should you wish to remove the cigar grip thingo (which of course I always do). Great review! Newbie here trying to take it all in. I've heard alot about the Fenix line and actually got to finger a TK12 and was very impressed. Good point - there was a time when a number of manufacturers supplied covers to for exposed grip ring threads ... but the practice seems less common lately. I've heard alot about the Fenix line and actually got to finger a TK12 and was very impressed. I've hardly heard a peep about the LD15 yet.